Hope International University has been selected as top military-friendly school by Military Advanced Education (MAE). 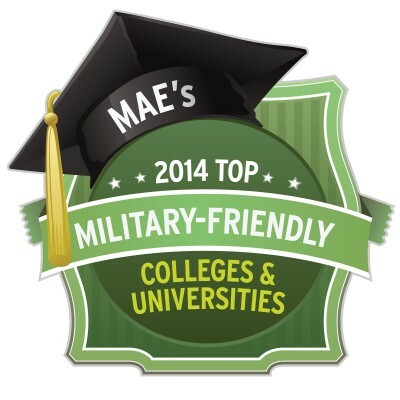 HIU will be included in the 2014 Guide to Military-Friendly Colleges and Universities, an annual list released in MAE’s December issue. Inclusion in the 2014 MAE Guide is particularly significant because of the record number of schools who responded to MAE’s extensive survey as well as the strict evaluation criteria. Institutions are evaluated in four major areas: Support Services, Financial Services, Military Culture, and Flexibility. Over the last few years, HIU has worked diligently to better serve current and prospective military students. Academic Coach Jennifer Stead serves at the University’s military representative, working one-on-one with students to help them achieve their academic goals. “Being able to encourage our military students, watch them grow, and work with each of them has been a blessing and a rewarding experience,” said Stead. MAE was the first publication to compile a list of military-friendly institutions. It remains one of the primary resources on educational benefits for armed services education service officers (ESOs), transition officers (TOs), and other top level commanders as well as servicemembers, veterans and their families. HIU is proud to offer a number of military benefits including an active duty tuition discount, the Post 9/11 and Montgomery GI Bills, and accepts military credits earned through service schools. The University’s commitment to the recruitment and retention of students with military experience is exemplified both by its inclusion in MAE's 2014 Guide as well as HIU’s designation as a Military Friendly School® by Victory Media. A complete list of HIU’s benefits, program information, and additional resources for servicemembers is available at www.hiu.edu/military. Hope International University is a regionally ranked private Christian university in Southern California offering undergraduate, online, and graduate programs. Founded in 1928, HIU integrates faith, service and learning. Through undergraduate, graduate, and online degree programs with faculty and staff dedicated to student success, HIU students experience a transformative educational experience and are prepared to make an impact with their lives. Our diverse student body represents 44 states and 13 countries around the world. To learn more, please visit the Hope International University website at http://www.hiu.edu or contact Katie Gladding, Director of Marketing, at 714.879.3901, x-2692.